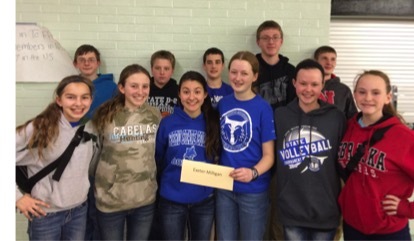 With a timely press of the buzzer, the 8th Grade Junior High Quiz Bowl team pulled ahead to win the Thayer Central JH Quiz Bowl on February 22, 2016. This was their second (back-to-back) win as they were also champions the same Quiz Bowl in 2015. Quiz bowls challenge students to think fast, and share their archived knowledge of math, science, history, geography literature, English grammar, and current events. This can be frustrating, as well as rewarding. After a question is read, each team has 10 seconds to “buzz in” and give the correct answer. If the answer is wrong, the opposing team will have another 10 seconds to answer. The frustration of buzzing in too late, or giving the wrong answer, is often forgotten in the thrill of answering ahead of the opposing team – especially when both teams are tied. 2016 Quiz Bowl Team (pictured L-R) – Front: Jaiden Papik, Kayla Geiger, Anna Sluka, Caitlin Murphy, Daisy Kanode, and Georgia Meyer. Back: Nick Hayek, Max Zeleny, Eli Johnson, Ryan Sharp, and Caleb Horne.